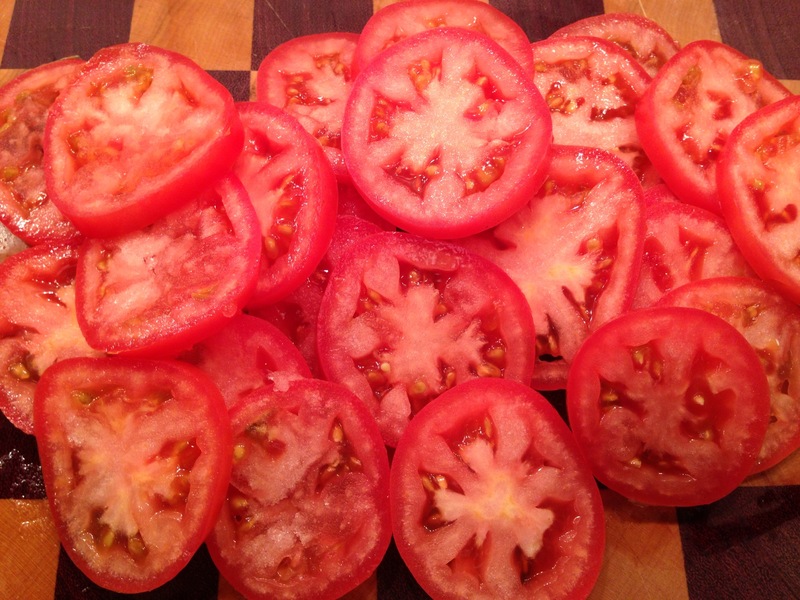 1) Slice plum tomatoes and eggplant as pictured above or to desired thickness for toppings on your pizza. 2) Place eggplant on a cookie sheet. 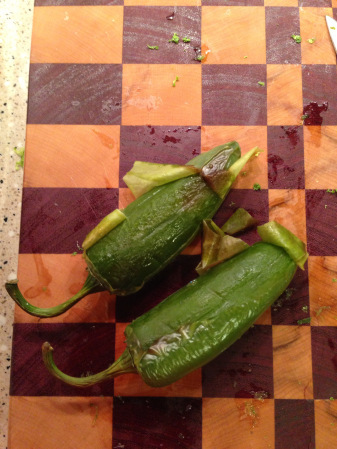 Sprinkle salt on both sides of the eggplant pieces to help draw out some moisture. Let the eggplant sit with salt for about 10 minutes. Pat dry and drizzle some olive oil on top of eggplant. Place in oven at approx 350 degrees for about 10 minutes. We ended up broiling the last few minutes to add some color. Take eggplant out of oven and place aside. 3)Sprinkle some cornmeal or flour on your work surface. I used my counter top that was wiped cleaned prior to beginning the process. Roll your dough out (I used wheat dough this time around). Tip: I also end up picking my dough up and pulling at all the sides and turning in either a clockwise or counter clockwise motion to help spread the dough out. 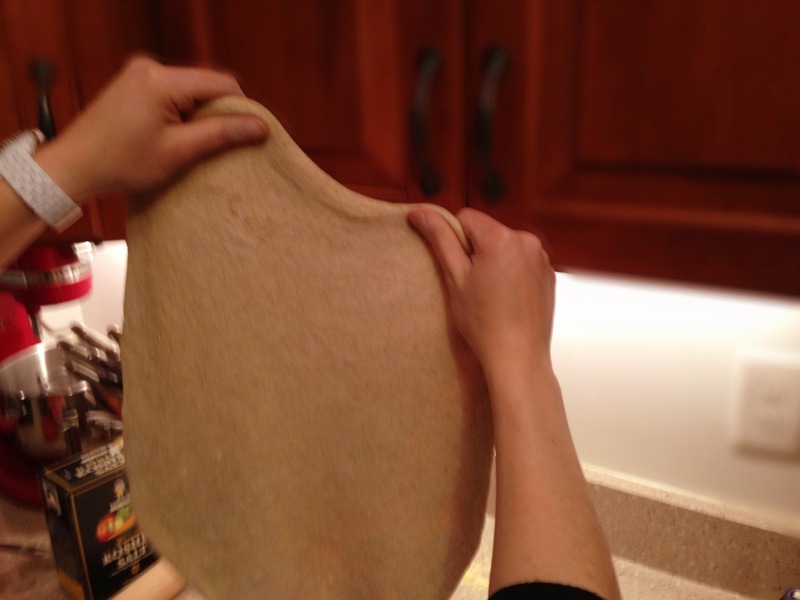 4) Place dough on a cookie sheet or a pizza stone. You can also place dough directly on oven grate I believe. (Let me know if you try it this way:) ) I love love love my pizza stone! We find if you heat your stone in the oven while the oven is preheating prior to placing dough on your stone, you achieve a more crispy crust. Place sauce on top of raw dough. We used a spicy arrabbiata sauce to add a kick to our pizza. 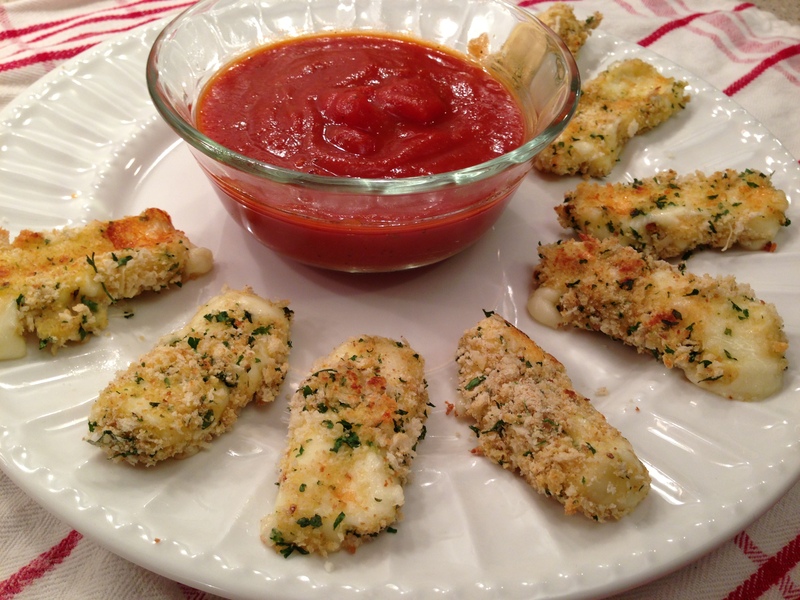 5) Sprinkle mozzarella cheese on top of sauce. Use a spoon and dollop ricotta over mozzarella cheese. I used a spoon to press each ricotta ball down to make a flat circle. 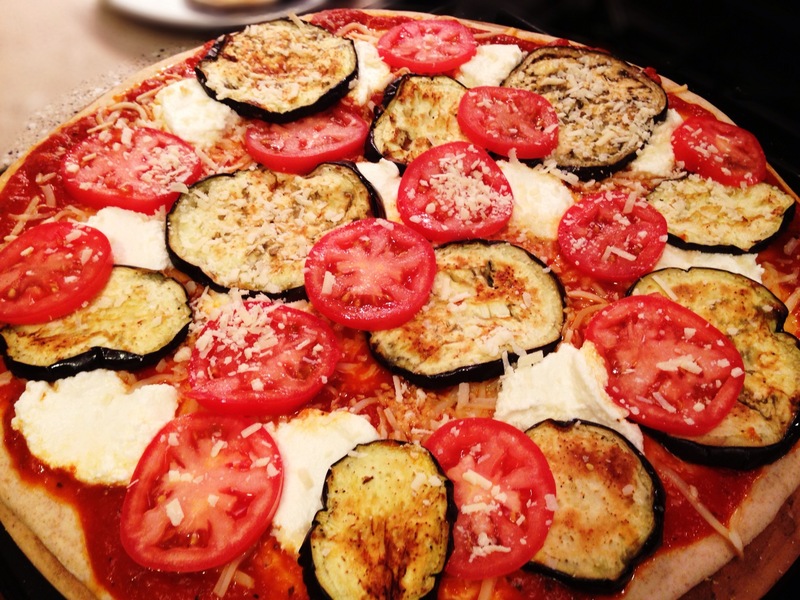 6) Place sliced eggplant and tomatoes on top of pizza in your own desired pattern. 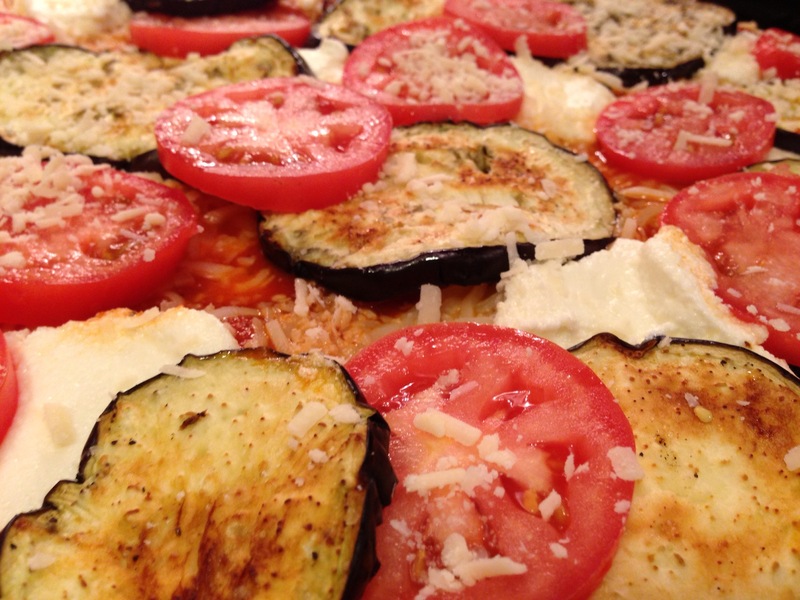 Sprinkle Parmesan cheese on top of eggplant and tomatoes. 7) Place pizza in preheated oven. We used an over sized spatula that was given to Mike from Santa this past Christmas. It really does help to have something this large to help manipulate the pizza when it is hot. Bake at 425 degrees for approx 10-12 minutes (oven time/temp may vary). After approx 12 minutes, we used the spatula to move the pizza off the stone from the bottom rack and placed it on the top rack and broiled it for approx 2-3 additional minutes to make a crispy and bubbly top. 8) Remove pizza from oven, be careful, its super hot! Top with shreds of basil as desired. We added a side salad of spinach, sliced avocado, roasted unsalted sunflower seeds and 1 tbsp of Annie’s Goddess Dressing. Enjoy! You’ve done it again, Bohlson. You never fail to make me incredibly jealous of your meal and your handy kitchen gadgets. 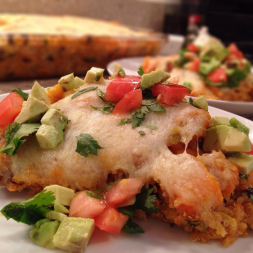 This looks good and if there are leftovers, gimme! I ate the left overs last night, with pie! But now that I’ve seen it used, it totally makes sense! Pizza sauce and melty cheese are like hot magma, why risk burning yourself?! That spatula is perfect. And that pizza looks divine. Next time I’m in Boston, I want some! I have to mention my favorite approach, which is to use 2 cups regular and 1 1/2 cups whole wheat flour for dough or bread. Good for serving a broad audience or for sensitive stomachs that can’t tolerate all whole wheat all the time.